Overmolding is a great injection molded feature you can utilize in your design to capture color contrasts, add flexibility or eliminate assembly. 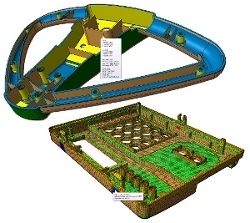 Take advantage of this feature by learning how to design your part for overmolding. Get the Xcentric overmolding guide (no registration required). The piezoelectric materials that inhabit everything from our cell phones to musical greeting cards -- converting strain and stress into electric charges -- may be getting an upgrade thanks to researchers at Virginia Tech. Their new design method and printing platform make it possible to freely design the sensitivity and operational modes of piezoelectric materials -- all while producing material that has sensitivities 5x higher than flexible piezoelectric polymers. 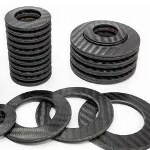 The Carbon Composite Bellows Spring (CCBS) from MW Industries is a system of carbon fiber elements that combine to work as a high-performance, lightweight, and design-flexible compression spring meant to replace conventional coil springs or metallic Belleville disc springs. It offers value through unique dynamic characteristics and unparalleled in-the-field design flexibility. A functional spring is made from several individual elements, paired in sets and joined to make a stack. The spring rate of the stack is determined by the number of elements, the base rate of each element, and their series or parallel orientation in the stack. Applications include motorsports, aerospace, outdoor recreation, general industry, and high-performance activities. 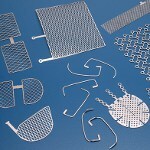 Tech-Etch specializes in the photo chemical etching of titanium. Because of its low weight, strength, and corrosion resistance, titanium is used in everything from jet engines to eyeglass frames. And because titanium is inert and completely biocompatible, it is also used in many medical implantation applications, as well as anode and cathode battery current collectors and telemetry antennas found in implanted medical devices. Get the Tech-Etch Precision Engineered Parts capabilities brochure (no registration required). 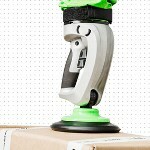 Piab's piLIFT SMART represents a paradigm shift for the industry: It's the market's first Industry 4.0-ready vacuum lifter. Sensing and monitoring movements and responding quickly to user intentions, the user-friendly vacuum lifter will lift and weigh loads simultaneously and collect and log data, making process statistics and analyses immediately accessible to the user through a web platform log-in. Every aspect of this unit has been designed with ergonomics and natural movements in mind. It also boasts a reduced power consumption of 76 percent! 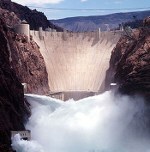 Hoover Dam, one of the most impressive engineering feats of the 20th century, generates hydroelectricity for millions of homes and businesses across the Southwest, and it's a constant challenge to keep the vital power source running smoothly. Recently, a team of innovative engineering experts -- led by Precision Machine & Supply and including Parker Hannifin and Controlled Motion Solutions -- wrapped up a massive multi-year retrofitting and refurbishing project to make the dam safer and more operationally efficient. Read the Parker Hannifin blog. 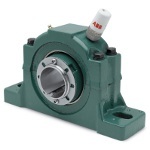 ABB has launched the ABB Ability Smart Sensor for Dodge mounted bearings, part of the ABB Ability Digital Powertrain, that enables "health checks" for bearings. The smart sensor technology provides an early indicator of any potential problems by assessing the condition of bearings from vibration and temperature information. Eighty percent of bearing failures are lubrication related, and a bearing "running hot" can indicate that proper lubrication procedures are not in place. Monitoring a bearing's vibration can also indicate potential system problems. Prevent downtime on applications such as bulk material-handling conveyors as well as applications in the food-and-beverage and air-handling sectors. 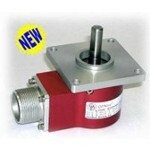 The Model QDH20 encoder provides an improved feedback solution in applications typically using a standard size 20 package. It features superb mechanical and environmental protection. Outputs consist of a quadrature A & B with reference pulse Z as a standard feature. The output can be configured with either the industrial standard 5- to 26-V OL7272 line driver or open collector outputs. Two heavy-duty bearing sets hold the output shaft, and two more bearings (along with an integral flexible spring mount) isolate the working pieces of the encoder from mechanical stresses. Features include 500-kHz fundamental frequency response, high operating temp option (100 C), and resolutions up to 5,000 lines per revolution direct read. Available through Servo2Go. Newark element14 is now shipping the new Raspberry Pi Compute Module 3+ for same-day dispatch. Raspberry Pi Compute Module 3+ delivers the enhanced thermal performance and ease of use of Raspberry Pi 3 Model B+ in a smaller form factor, with a choice of memory variants suitable for a broad range of embedded applications including IoT devices and industrial automation, monitoring, and control systems. 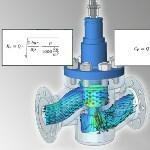 Compute Module 3+ simplifies the design process engineers need to undertake when developing a System on Module (SoM) solution into their final product. Engineers do not need to concern themselves with the complexities of interfacing with the BCM2837B0 processer directly and instead can concentrate on designing the interfaces to their own IO board and their application software -- simplicity that fosters rapid development. We were excited last June when Ford released details of its 526-hp 2019 Mustang Shelby GT350, but now the pony car maker has gone one better. Arriving this fall, the all-new 2020 Mustang Shelby GT500 is the most powerful street-legal Ford ever -- with a supercharged 5.2-liter V8 producing more than 700 hp. Capable of mid-three-second 0-60 mph and sub-11-second quarter-mile scores, Shelby GT500 owes a lot of its impressive new attributes to tech transfer from Ford GT and Mustang GT4 racing programs. Bye bye motors! Engineers from NASA's Glenn Research Center, NASA's Armstrong Flight Research Center, and Boeing successfully used shape memory alloys to move a full-sized wing section of an F/A-18 Hornet this past summer. Researchers from the U.S. Army and top universities have discovered a new way to get more energy out of energetic materials containing aluminum, common in battlefield systems, by igniting aluminum micron powders coated with graphene oxide. Happy 150th birthday to Dmitri Mendeleev's version of the periodic table! In his brief TED talk, Lou Serico takes a look at why Mendeleev's table is the one that has endured and evolved (to the current table shown here). One key example is eka-aluminum, an element whose existence Mendeleev predicted years before it was discovered. Learn more: A quick and fun overview of Mendeleev's life courtesy of SciShow. Early pressure drop investigations and optimizations are crucial for today's efficient designs. This short 3-minute video from Mentor shows you how to conduct pressure drop characterizations such as determination of kv or cv coefficients in FloEFD, the leading frontloading CFD simulation solution for design engineers.